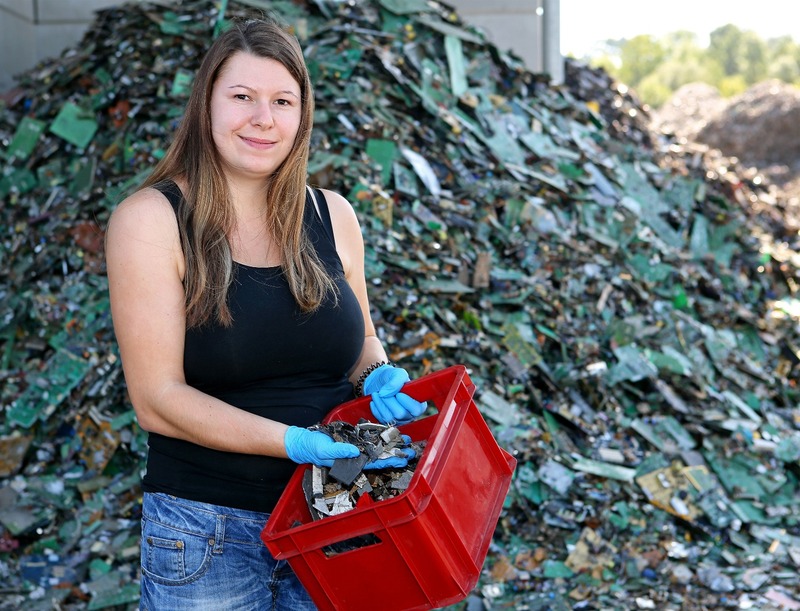 Cornelia Wieser very carefully examines the recycled material at the MGG plant in Metran. 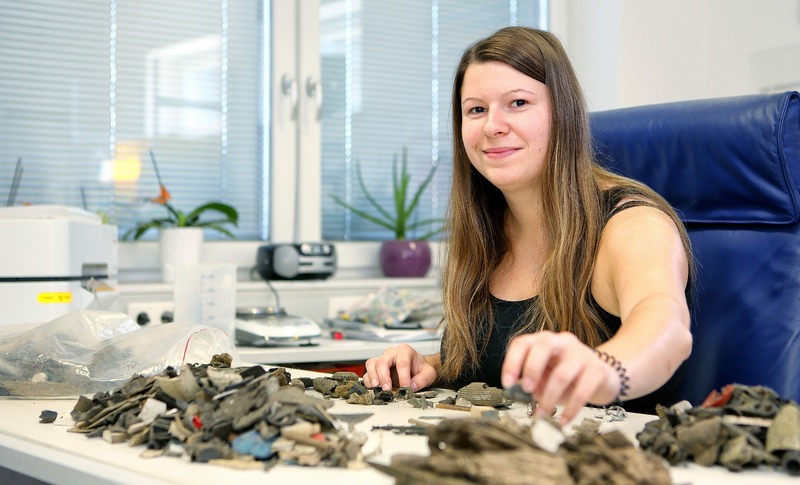 She sorts, crushes and analyses large and small parts – and she knows exactly what it it is about with these recycled materials. Cornelia gives an insight into her work environment in the relay interview for this MGG Newsletter. Cornelia Wieser, you are responsible for the laboratory analyses at Metran. What exactly do you do? Wieser: Broadly speaking, I analyse different material samples – from e-scrap fractions to fractions of our plastic sorting system. These samples can originate, for example, from one particular sorting process in our recycling plant. In these cases I check whether the settings of the separation equipment are set correctly and that the separation is working correctly. But the samples can also come from a big bag of a final product that we produce. With these analyses, I can check whether the quality of the material really fits with that we have guaranteed to our customer. What methods are you applying? Wieser: Qualitative and quantitative methods are being used. Especially the quantitative evaluations can be complex, for example if larger fractions have to be sorted by hand. Yes, we can imagine that this may include many parts? Wieser: Yes, the most extensive analysis that we did so far included 20,000 particles, but that was of course part of a larger project experiment. From each big bag with ready-for-sale material, of course, I get a much smaller but still representative sample. Wieser: Fortunately that is right – I use an infrared spectrometer. With that spectrometer I can for instance determine the type of plastic of a particle. However, before I can do this though, the parts of a sample need to be sorted out by means of a sink-float analysis. How does this sink-float analysis work? Wieser: That is really not a high-tech system and I normally use simple buckets for this purpose. These contain a water-salt mixture, with different densities. Parts with a low density materials float and can be easily fished out; the parts with a higher density material sinks to the bottom of the bucket. Different groups of plastics can thus be separated easily. And you also analyse very fine parts, isn’t it? Wieser: Indeed, I also analyse particles within the size range of 0-1 millimeter. I use a Sieve Stack, which allows me to create several size ranges. The small pieces can be grinded to powder by using one of the two cutting mills that I can use. But I can also cut larger parts into becoming small and eventually even as small as powdery dust. The powder, which finally emerges at the end of the process, is then pressed into tablets and these tablets are examined in an X-ray spectrometer to define their composition. For the small particles, it is particularly important to be very careful and accurate. But it is exactly this that makes my work so exciting, as I can determine precisely – even for these smallest particles – the composition of these materials. With a detailed look at a pile of material or even with a handful of parts, it is impossible to determine the value of the material. With this high-tech device, which can be used to analyse a wide variety of samples, we can now have a detailed view of the composition. This is very helpful for example to determine the value of a shredded and powdered sample of printed circuit boards, you see? Doing these analyses, you will certainly be confronted with extraordinary challenges? Wieser: Of course. I am working on many exciting projects. Just to take a few examples, I have already done many analyses from test runs for the preparation of a recycling test with pentane refrigerators, for the recycling of display devices and we are currently running a test with solid plastic waste from municipal collection points. But I also investigate samples of Metal-Recycling Mü-Gu in Amstetten or even materials from external cooperation partners of the Müller-Guttenbrunn Group. It is always a challenge and particularly exciting, whether everything works as it should be. Is there a typical daily routine in the laboratory? Wieser: The days can be very different. Often I have a plan for myself and suddenly there is a colleague and would like to see the results of a special sample, which then becomes a priority. This will then change the plans. In addition, I sometimes represent colleagues as a operator on our plastic sorting line – and then it is often interesting to check the plant settings. How did you ever get to work in such a lab? Wieser: I always wanted to work in a laboratory. After I graduated at the HLW in Weyer, the opportunity arose for me to start working at Metran and I immediately took the opportunity. Since there was no laboratory before at Metran, I had to acquire the necessary know-how. And this is how I acquired the knowledge of how to deal with each machine and how to set up the entire laboratory so that it works smoothly. And this is how it should be! What a wonderful end of our relay interview. Thank you for the exciting insight in the laboratory work at Metran and I wish you a lot of success in your interesting job.